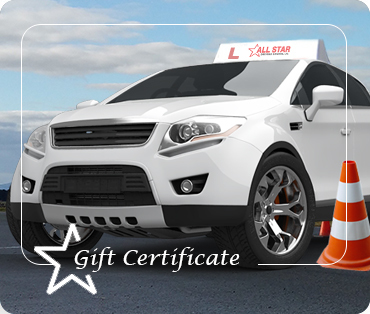 All star is the best place to expand your knowledge on driving and how to be safe on the roads. The instructors are very helpful and are always in a positive attitude. I'd also like to give a special shout out to AJ for being a great teacher. I have learnt a great deal about driving a vehicle safely. The teaching method is active and lively. Great class. Engaging & fun. Never bored. Informative. Good learning tools like dvd’s diagrams and PowerPoint’s. I like this class, the teachers great! Everyone was so nice! I learnt a lot about traffic laws, I now feel as if I can pass my G2! Thanks! This class was very interesting and especially fun. I really learned a lot of stuff that will honestly help me in the future. AJ was hilarious and a great teacher. Everything was well organized and the class was great. The slide show and short videos really helped with learning and remembering details. I’m glad that AJ also gave us good advice on our lessons and also made the class enjoyable by telling us stories overall, great class and great 4 days here at All Star Driving School. This class was very entertaining; because of the way it was taught. I have learned a lot in these 4 days, and I am very grateful for this course and everything it has taught me. Although at times it felt a bit repetitive it benefited me in a huge way by getting the rights and wrongs of the road stuck in my head. I recommend this course because it’s the only way to see and know how easy mistakes can happen and how to avoid them. The instructor was also very friendly. I learned a lot from Mac he was really funny and enjoyable. The in car is comfortable and I am confident, Faisel is an excellent instructor. The in class was fun and entertaining, learning about driving was motivating. Mac was a good guy and a beauty. I thought it was a good class. I learned stuff I didn’t know and could have failed my G2 without knowing. AJ was a great teacher and kept us entertained. This 4-day course has been amazing! I was really surprised by how fast and easy these 4 days past. I feel that I learned a lot even though the in class is only theoretical, but I believe the videos and all the examples really gave me a live view of the road. All the stories have really helped me understand the dangers of the road and why safety is so important. AJ your enthusiasm and stories have made this course a breeze. The teachers are phenomenal! Hilarious and connects with the students! Naveed is the best! The course was informative and interesting coming into the class knowing almost nothing about driving I felt that the course covered a lot of basic knowledge without skimping on details. I’m grateful for AJ’s humorous but genuine approach. I thought that the class was great and AJ was really entertaining, I enjoyed listening to all his stories. I felt that I learnt a lot and this was a fun and informative class. The past 4 days I have learnt a lot of new and useful techniques to be a better driver. AJ was a great instructor and teacher. He made it easy to understand the course and related many of the topics to real life issues. He was very professional and I would recommend him as an instructor. Overall the course was a good learning experience. I had tons of fun at my All Star in-class driving sessions. Mac was extremely funny and his stories helped me understand the dangers and realities of driving. My in car driving experience has also been good. Instructor has been good and classes have been very informative. Mac has been a great teacher all of the information was useful. After the 4 day course, I have learned a lot regarding the types of parking, turns, signals as well as drinking and driving. This is a highly professional school that I would recommend to my friends and relatives. I loved malik, He was the nicest man and made driving school very enjoyable. David was very knowledgeable and helped me better understand the importance of safe driving. David, the instructor was insightful and entertaining using videos and real life scenarios to educate students on how realities and dangers of driving. He was very firm in his attempt to strike fear into the students to ensure them that deriving is a serious and skill heavy task. I learned a lot of tips on hand holding my future insurance and also about the clarity of rules (municipal & federal). In any case, my experience with All Star was great! I felt the testing was fair, teaching was organized, and that I will leave this class as a responsible safe, and careful driver. This 4-day course has been very fun. I’ve learnt a lot about driving that I didn’t know before; AJ’s stories and life experiences really helped me understand the consequences that could result due to unsafe driving. AJ is a very entertaining and funny guy; his humour has made this course a pleasant learning experience for me. I feel like the past four days have been really fun and helpful for my driving experience. I cannot wait to get on the road with my instructor after these past days. AJ is very educational and fun at the same time. I would recommend this course a ton. I would recommend this course because it is useful in preparing us to drive and I also had fun while learning important information. I liked the activities and dvd’s and also the instructor was very friendly and helpful. My experience in this class has been surprisingly amusing, but also extremely informative! I learned a lot, and was never as boring as I thought it would be! My driving instructor (Mac) has been nothing but helpful. Class was very interesting. We learned valuable information. The videos we watched were defiantly eye opening, making me aware of the many different accidents. The class was both informative and entertaining. I’d highly recommend it to anyone looking to learn more and I personally feel more prepared for the driving portion of the course. I loved Malik's fun personality lightening up the mood in the class, making morning a lot easier. David was very friendly and knowledgeable while teaching the class. I liked Malik's tips for going to get our G2. Very helpful. David gave good information that would help me be a safe driver. David sand was an amazing teacher! The class was fun, yet just as informative. I really liked the class activities. I thought that the in class course was very informative, and interesting. I found that this class exceeded my expectations for driving school. It was extremely entertaining and the stories that the instructor told added a personal touch to the lessons, I learned many new aspects of driving as well as picking up on tips that will be very helpful to me once I begin driving. These 4 days were excellent and very well taught; it was an amazing experience for me. I thought this course was very well done. AJ was very funny and kept the class very interesting with his stories. I will definitely recommend this place to my friends and recommend AJ. I would recommend this course to others because its enjoyable and you learn a lot! I liked how supportive the instructor was and how fun he made the class. David always answers every question! My instructor, Peter, was great he was very nice & patient. In class was very informative and helpful. I am thank you for your services. Mac was extremely knowledgeable. I really enjoyed the class. I learned many new things, and little details. Our teacher, AJ, was very informative. I highly recommend this class to anyone.